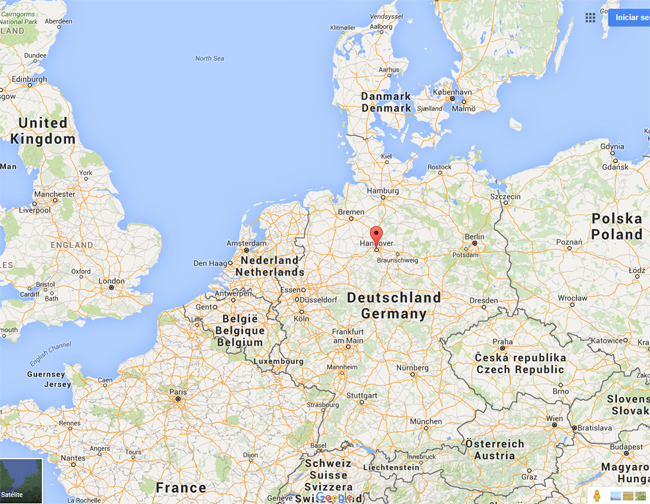 Hannover is a major centre of Northern Germany and the country's thirteenth largest city. It was founded in medieval times on the east bank of the River Leine. The city is of national importance because of its universities and medical school, its international airport and its large zoo. It is also a major crossing point of railway lines and highways (Autobahnen), connecting European main lines in both the east-west (Berlin–Ruhr area) and north-south (Hamburg–Munich, etc.) directions. The Hannover fairground is currently the largest in the world (in 2000 hosted the world fair Expo 2000). Every year the city hosts the Schützenfest Hannover, the world's largest marksmen's festival, and the Oktoberfest Hannover, the second largest Oktoberfest in the world. The landmark of Hannover is the New Town Hall (Neues Rathaus). At the historical centre of the Old Town another points of interest are the huge Marktkirche (“The Church on the Marketplace”, the main Luteran church in Hannover) and the Old Town Hall. In the surroundings, the Leibniz House, the Nolte House, and the Beguine Tower are worth visiting. Other points of interest are the Kreuz-Church-Quarter and the Ballhof theatre (once the royal sports hall). Outside the Old Town are the Market Hall, the Leine Palace, and the ruin of the Aegidien Church which is now a monument to the victims of war and violence. Some other interesting places to visit are the Waterloo Column, the Wangenheim Palace, the Cupola Hall of the Congress Centre, the Garten Church, the Luther Church, the Gehry Tower (designed by the American architect Frank O. Gehry), the Opera House (designed by the famous architect and urban planner Georg Ludwig Friedrich Laves), the Central Station, the Maschsee lake and the city forest Eilenriede (which is one of the largest of its kind in Europe), the Royal Gardens of Herrenhausen and the worldwide famous Hannover Zoo. The 36 most important sights of the city centre are connected with a long red line, which is painted on the pavement. This so-called Red Thread marks out a walk that starts at the Tourist Information Office and ends on the Ernst-August-Square in front of the central station.